52% of U.S. adults say their current finances are "excellent" or "good"
54% say their financial situation is "getting better"
WASHINGTON, D.C. -- Americans' assessments of their current financial situation are the most positive they have been in a decade, continuing a mostly upward trend since 2013. Fifty-two percent of U.S. adults now say their current financial situation is "excellent" or "good." 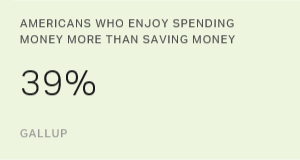 These data are from Gallup's annual Economy and Personal Finance survey, conducted April 5-9. The last time Americans' positivity about their current finances was this high was in April 2007 (55%) before the Great Recession. 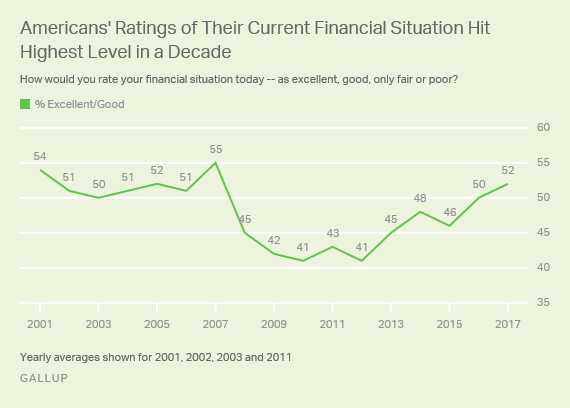 By contrast, it reached its lowest points in April 2010 -- on the heels of the recession -- and April 2012, when 41% of U.S. adults said their financial situation was "excellent" or "good." The percentage of Americans who felt positively about their current financial situation improved in recent years but remained at or below 50% until the most recent survey. Americans are also more optimistic about their future financial situation. Fifty-four percent say their financial situation is "getting better," up from 47% in 2016 and similar to the percentage who feel their current financial situation is "excellent" or "good." Americans' optimism that their financial situation is improving is at its highest level since January 2003. It is also well above the record-low 29% Gallup recorded in October 2011 after the "Black Monday 2011" stock market crash, which resulted from a downgrade of the U.S.' credit rating. Republicans and Democrats have similar views of their current finances, with 58% and 53%, respectively, saying their current financial situation is "excellent" or "good." However, Republicans are far more optimistic than Democrats about the direction in which their finances are headed. Currently, 62% of Republicans say their financial situation is improving, compared with 45% of Democrats who say the same. One year ago, the roles were reversed, with 55% of Democrats and 39% of Republicans saying their financial situation was improving. A similar partisan shift occurred from 2008 to 2009 after Barack Obama's election, when Democrats became more positive about their financial situation and Republicans became less positive. Therefore, while the president's political party probably has little direct effect on Americans' finances, especially in the short term, it does affect partisan views of the future. President Donald Trump's election in November has undoubtedly played a role in the most recent reversal, with Republicans now more optimistic and Democrats more pessimistic in the wake of a Republican replacing a Democrat in the White House. Gallup has found similar partisan attitudes on spending -- Republicans have become more positive about the amount of money they have to spend since the election, while Democrats have become more negative. Americans are more positive about their current financial situation than they have been in a decade, with majorities upbeat about both their current financial state and their future financial situation. 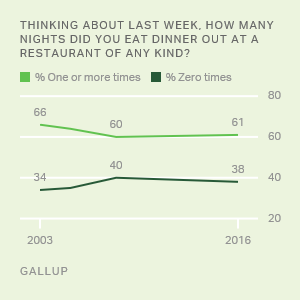 This is the first time since before the Great Recession that majorities of U.S. adults reached this point on both measures. 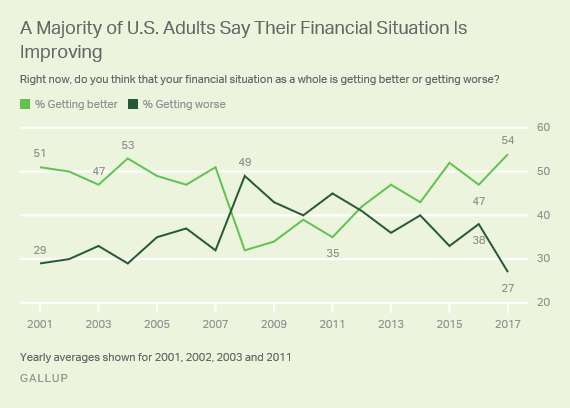 Americans' optimism that their financial situation is improving has now returned to pre-recession levels, and their perceptions of their current financial situation are nearly restored as well. Republicans are more likely than several months ago to feel good about the money they have to spend. Democrats' views have moved in the opposite direction. Household income and education are strong predictors of Americans' views of what social class they are in, although the terms "lower class" and "upper class" are infrequently used regardless of income or education.